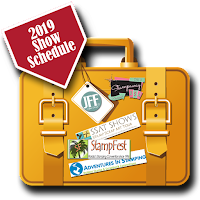 Hi Guys it's DT member Jen from Scrap Shack Designs. 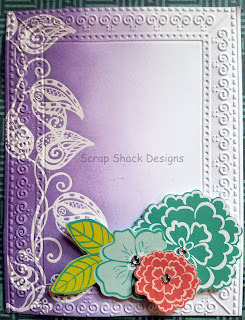 For today's card I decided to try something a little different and instead of using a flower stamp I used the Stamptangle Leaf Flourish stamp as a border and created this card. To start this card off I heat embossed that beautiful flourish stamp set and then used ranger white embossing powder to really make it stand out. I then took some purple ink and sponged the edge working my way end. My tip when sponging is to start off the paper and then work it inwards, this will give you the gradient look that you see above. Once I was done stamping, embossing, and inking I grabbed an embossing folder and ran the whole card front through my Big Shot. The card was beautiful looking as it was but I could not help adding my new floral die cuts and some clear gems to finish it off. A flourish is always a good starting point for pretty embellishments! Good choice Jen! I like how you used it as a border and GORGEOUS purple background! This is beautiful, Jen! Love everything!